American climbers Garrett Madison and Ben Jones, both of whom summited Everest in the final weeks of May, have said that the Hillary Step has been significantly altered. Their revelations, to Outside magazine, bring clarity to a debate that left the mountaineering world wondering whether or not Everest’s most iconic feature still existed. The Hillary Step, which is located at an elevation of 28,839 feet, was a near-vertical rock outcropping 200 feet below Everest’s summit. 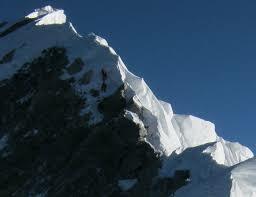 It has long been one of the most foreboding obstacles on the mountain’s South Col route. Named after Sir Edmund Hillary, who in 1953 used the 39-foot feature to make the first ascent of Everest with Tenzing Norgay, the step was among the most challenging and notorious features on the mountain.